Greg Bryk | TV, eh? Fifteen years ago, Paul Gross saved Greg Bryk’s life. I was on the phone with Bryk to talk about Season 2 of Frontier—Discovery’s historical drama about the history of the Canadian fur trade returning Wednesday at 10 p.m. ET/7 p.m. PT—when I mentioned Men with Brooms came out 15 years ago. The role of Alexander “The Juggernaut” Yount was the first of many, many memorable characters Bryk has played over the year. Whether it’s alpha werewolf Jeremy Danvers on Bitten, the Jack of Knives on Wynonna Earp or Grady on Mary Kills People, Bryk has amassed an IMDB page packed with memorable characters. We spoke to Bryk about his acting choices and what’s to come for Cobbs Pond, business associate/lover to Montreal businessman Samuel Grant (Shawn Doyle), in Season 2 of Frontier. They say that the clothes make the man. Is that true for Cobbs Pond? We literally created this character from scratch and when I first walked in and I saw the fox hat. When [costume designer] Michael [Ground] handed me the hat I had everything I needed to know about this character. There is such a playful malevolence about him and the idea of sexuality and femininity and being placed in that historical context but to be this completely complicated and contemporary man, in a lot of ways, was a fascinating adventure. We found moments throughout Season 1—some dark, horrific moments and moments of real longing and being lost—and that arc/descent accelerates during Season 2. Cobbs goes to some places that I was so thrilled to get to be able to take him and really explore what love means to this character, what loyalty means, what ambition means, what greed means, what savage revenge means … all the while spinning in the most beautiful clothes one could ever hope to dress themselves in. It sounds like you personally had a hand in creating Cobbs. They fleshed the character out in very broad strokes and allowed me to bring so much of myself to the character. I’m really lucky in that a lot of directors and showrunners that I have worked with trust me to personalize the work and bring elements of myself to the character. There are things this year that happen with Cobbs and parts of monologues that are straight camera roll and they just let me go into myself. There are a couple of scenes which are shocking and brutal and violent but also incredibly vulnerable. It’s me transferring an experience I had being in love with this girl when I was in Grade 5—that first love—and they let me drag Cobbs into my longings and my wants and my vulnerabilities. But, also, this strength emerges in Cobbs this year where he is a force to be reckoned with. There are some moments that are absolutely crazy. There are places Cobbs goes that I think the audience—who enjoyed him in the first season as this glitter who was thrown into a very dark world—will be slack-jawed at some of the things that will happen. He’s quite, delightfully, mad. You’ve created memorable characters throughout your acting career. Where does that come from? I’m a very cautious, almost timid, person in real life. I like routine. I stay in my house with my kids and my wife and my dogs. I literally walk the same path every day and I like that. In the real world, I like to control as much as I can. But in my work, it’s the chaos, man. I’m fearless. There is nothing I won’t reveal about myself or someone else and I don’t ever apologize for anything that I do. I am utterly without censure when the cameras roll and I think it saves my life. I became a father in theatre school and I had to learn to compartmentalize. Discovering myself as an artist was walking in step with being a husband and a father. There have always been these parallel tracks. I can happily live away from that live wire in the middle, but goddamn it I love to dance on it. When the lights go up and the camera goes on, it’s like a cage opens and the lion hunts the zoo. Frontier airs Wednesdays at 10 p.m. ET/7 p.m. PT on Discovery. In a perfect world, the creators and producers of a television show find out their show’s been renewed with plenty of time to develop scripts, scout locations for filming and nail down schedules for cast and crew. That didn’t happen with Mary Kills People. On June 5, Corus announced via press release that a second season of the drama, starring Caroline Dhavernas, had been ordered. The producers were informed of the renewal just days before the press release dropped. “People kept asking me if we’d been renewed and they thought I was being coy,” executive producer Amy Cameron says. “I really didn’t know. We got a surprise phone call from Rachel Nelson [Corus’ director of original content] who said, ‘We want to release the news, so don’t tell anybody.’ It was that specific and that quick.” Days later Dhavernas was in Toronto promoting a second season that is, well, still be developed. It’s suddenly a very busy year for the trio at Cameron Pictures. The production company, consisting of Amy and Tassie Cameron (Rookie Blue) and Caledonia Brown, has got Ten Days in the Valley set for broadcast this fall on ABC—and CTV in Canada—and Little Dog in production in Newfoundland to air this winter on CBC. But back to Mary Kills People. When we last left Mary (Dhavernas), she was no longer being investigated for her role in the deaths of terminally ill patients, Des (Richard Short) seemed to have gotten his life back on track and Ben (Jay Ryan) and Mary appeared to be a couple. Meanwhile, Grady (Greg Bryk) was dead and Mary’s sister, Nicole (Charlotte Sullivan), announced she wanted to be part of Mary’s team. Will the duo angels of death become a trio in Season 2’s six new instalments? “We are moving quickly,” Cameron says. “We’re at outline stage on about half of the episodes and hoping to be pitched the back half in the next week or two.” She’s particularly excited to have—in addition to series creator Tara Armstrong, writer Marsha Greene, script coordinator Justin Giallonardo and showrunner and executive producer Tassie Cameron—newcomers Lara Azzopardi (Backstage) and Rookie Blue and Saving Hope co-creator Morwyn Brebner in the writing room. Cameron acknowledges Mary Kills People deals with dark subject matter, but credits the writing team and cast for keeping the tone from being too heavy and a downer to watch. Cameron is mum on sophomore season storyline details—those are still being worked out—but did give us a hint. Well, Saving Hope fans, what’s your reaction to Sunday’s Season 5 return? What started out wonderfully—Charlie (Michael Shanks) proposed to Alex (Erica Durance)—crashed and burned by the end, with her giving the ring back and walking away. Fans may not be happy about that story angle, but Durance couldn’t be more thrilled. As an actor, she relishes a challenge and Alex’s change of heart is exactly that. We spoke to Durance over the phone; she gave us some exclusive scoop into what Alex does next, the effect Dr. Manny (Jarod Joseph)—and characters played by Greg Bryk and Missy Peregrym—have on Alex’s life, and how she can operate on you if the situation called for it. This first episode of Season 5, “Doctor Dustiny,” certainly begins dramatically. Charlie was shot by Crenshaw, Crenshaw is dead and then Charlie proposes to Alex. Erica Durance: I know. We thought we’d hit all of the most important things at the get-go and get fans excited. It just sets our show off at a faster pace. We have a lot of story to tell and only 17 episodes after the first one to tell them. So, Charlie proposes—something the fans have wanted since Season 1—but by the end of the episode Alex is giving him his ring back. What was your reaction reading that in the first script? Oh, I laughed. I thought it was fantastic. I love it when they surprise me. I’m one of those actors who like the twists and turns and the unpredictable and the challenge of starting in one specific place and by the end of it, she’s giving his ring back. How am I going to get to that point emotionally? I like the challenge of it and it gives the audience a glimpse into what’s to come in the rest of the season. This character goes on this final little journey. It’s mayhem at the hospital. The writers told me it’s fun to have Alex and Charlie together for a bit, but then it gets boring. That roller coaster must be a lot more fun than being cuddly and happy all the time. Exactly. I said, ‘Listen, if you put us together and have us play board games, I’m going to lose my mind.’ I don’t like drama in my real life, but I want pretend drama. I want conflict and I want my character to be unpredictable and get to go on that journey. During my set visit, I was shown a motorcycle. Apparently, it’s Alex’s motorcycle. Is that true? Alex rides a little bit, but not much because, by that point, I had let everyone know I was pregnant. I wanted to ride, but no one would let me ride! Slightly outside of her form, which is what’s fun about it, is that she decides to take that on because it’s something she’s always wanted to do. Because of the decision, she’s made with Charlie, she’s exploring some avenues. She’s always been the good girl and has always done the right thing. She’s tempting fate a little bit. Being able to play another layer of Alex must be exciting. It’s funny because you’ll have some actors on-set that don’t want a whole lot of conflict and want everything explained perfectly. I don’t want everything explained, I want it to be messy because that’s what we’re like in real life. I would get into these little debates with people at work. It doesn’t have to make sense because, often, we don’t make sense as people. We run off of emotion and do dramatically different things than we say we’re going to do. Does Alex get a tattoo? A piercing? How far does she go? Oh god, I pitched it! You’ll just have to watch and see! [Laughs.] If they had taken on what I wanted to do, it would have been very different. I don’t know what people would have thought of Alex but I would have had a great time. Let’s talk about a few new characters this season. How does the new CEO, played by Joe Dinicol, affect day-to-day life at Hope Zion? He interacts mainly with Dawn [Michelle Nolden], who goes head-to-head with him. It’s very interesting because she’s always used to having power and this upstart comes in and kind of takes over. He is in there to cut costs and fix things and creates a lot of chaos. People lose their jobs and he starts to hit on one of the doctors there. 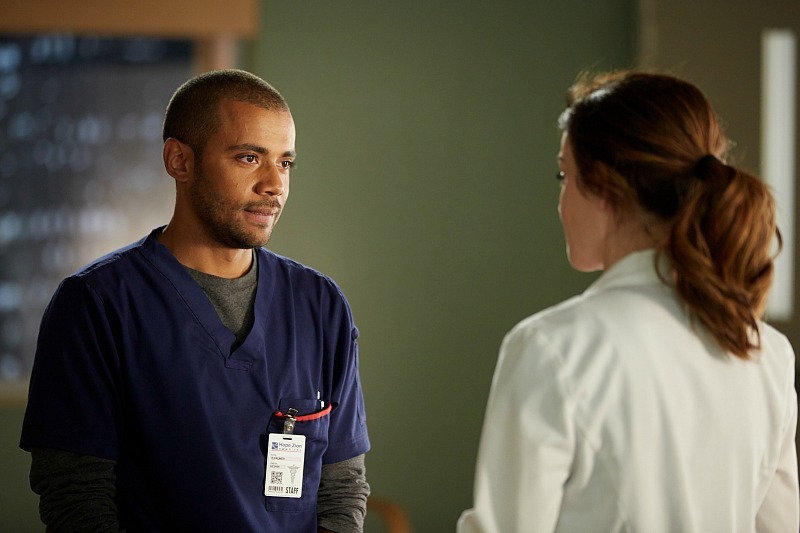 What can you say about Alex and Dr. Manny, played by Jarod Joseph? We saw him briefly on Sunday night. Manny is a character that makes Alex laugh and she has a lot of fun with him. He is a different kind of dynamic for her, so I think the audience will really love to see unfold and where it ends up going for her. There are several guest stars this season. What can you tell me about Greg Bryk’s character? That was a completely different kind of storyline for us. It was a little bit of a departure because he brought a little more danger to the episode and to Alex. She has to track this guy down and he’s in the witness protection program, and she has to try and convince him to save his son. Again, danger, and some comedy and a heartrending story. Greg is such a lovely actor. What about Missy Peregrym? Anything you can tell us about her character? Missy and I worked on a couple of episodes together and she challenges Alex in a completely different way. It was like working with a sister, we had this wonderful banter and had this sarcastic back and forth that I’ve never had before. What will you miss about Saving Hope? I’ll desperately, desperately miss my cast and crew, the people who worked with me on a day-to-day basis. They made me laugh so much. I’m actually going to miss all of the medical stuff that we learned. Our medical consultant, Bryce Taylor, he was a chief of surgery, and he’s in there working with us and teaching me how to suture. I was always learning something every week. If there was a medical emergency and someone needed a stitch or two, could you do it? Yes! I’ve learned enough to cut you open without cutting any vitals and take things out. I don’t know if I can replace anything, but I can stitch you back up! 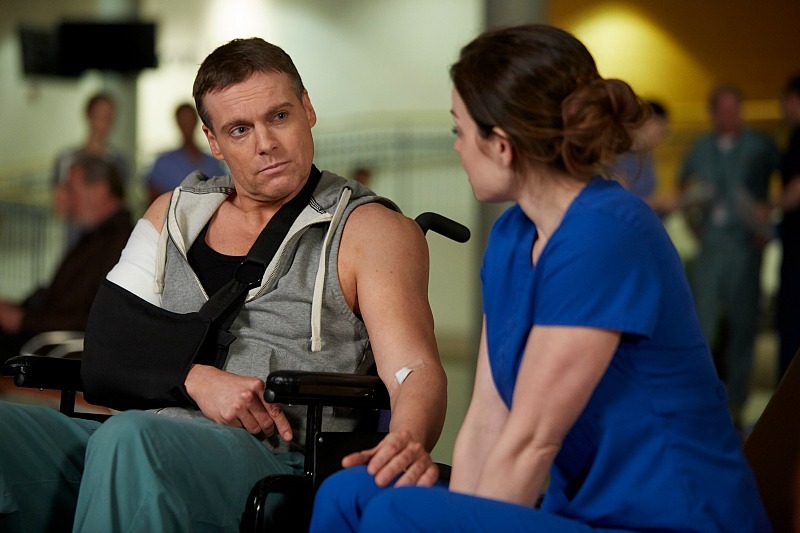 Saving Hope airs Sundays at 10 p.m. ET/PT on CTV. With less than a month away until Frontier‘s debut on Discovery, and we’re thrilled to present a photo gallery of the major cast and the characters they’ll play. And while we’ve known folks like Jason Momoa, Allan Hawco, Shawn Doyle and Jessica Matten were involved from the beginning, finding out Greg Bryk, Katie McGrath and Alun Armstrong have roles in the six-parter have gotten us giddy. 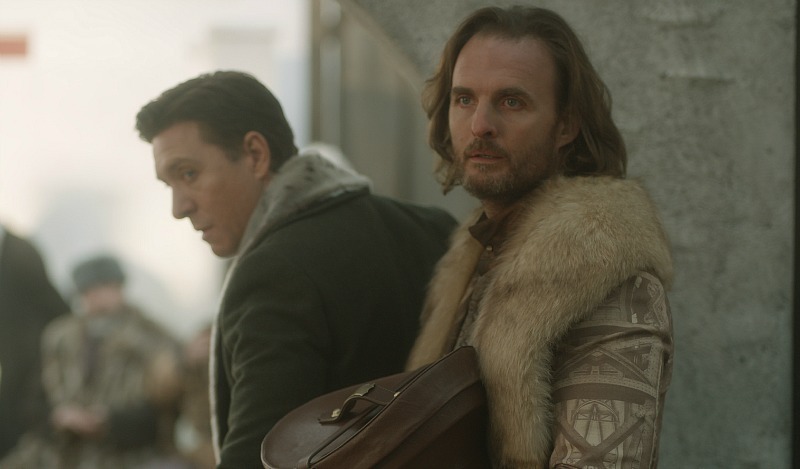 Frontier—co-created by Rob and Peter Blackie—follows Canada’s violent history circa the 1700s, as warring groups battle for control of the country’s fur trade. Frontier debuts Sunday, Nov. 6, at 9 p.m. ET/6 p.m. PT on Discovery. Leading independent studio Entertainment One (eOne) and newly minted Cameron Pictures Inc., alongside Canadian broadcast and production partner Corus are pleased to announce that principal photography has begun on Mary Kills People, the provocative new Global original series starring Caroline Dhavernas (Hannibal, Off The Map, Wonderfalls). Created by Tara Armstrong, Mary Kills People is executive produced by Tassie Cameron (Rookie Blue, Flashpoint, The Robber Bride). Directing the series is award-winning Holly Dale, whose previous credits include The Americans, Dexter, Castle and the critically acclaimed series Durham County. The six-part one-hour drama shoots in and around Toronto through the summer and is set to premiere on Global in Canada in early 2017. Set in the morally grey world of assisted suicide, Mary Kills People is an intense, controversial, and thought-provoking drama. The series follows Dr. Mary Harris (Dhavernas), a single mother and emergency doctor by day, who also moonlights as an underground angel of death — helping terminally ill patients who want to die and slip away on their own terms. So far Mary has managed to stay under the radar; but business is booming, and her double life is getting complicated. When her world starts to unravel, Mary realizes she’s going to have to fight dirty if she’s going to stay in the killing game. Also announced today are additional cast members joining Dhavernas in the series. Jay Ryan (Top of the Lake,Beauty and the Beast) has been cast as Joel, one of Mary’s terminally ill clients, but a mutual attraction blurs the lines of their doctor-patient relationship, while Richard Short (Vinyl, 666 Park Avenue) has joined as Des, Mary’s trusted partner in crime. Rounding out the cast is Lyriq Bent (Book of Negroes, Rookie Blue) as Frank, Joel’s friend who worries he’s getting in too deep with Dr. Death, Greg Bryk (Bitten, A History of Violence) as Grady, Mary’s drug supplier, Abigail Winters (Between, Saving Hope, Rookie Blue) as Mary’s teen daughter who learns that the people closest to her are not what they seem and Charlotte Sullivan (Rookie Blue) as Nicole, Mary’s concerned sister. 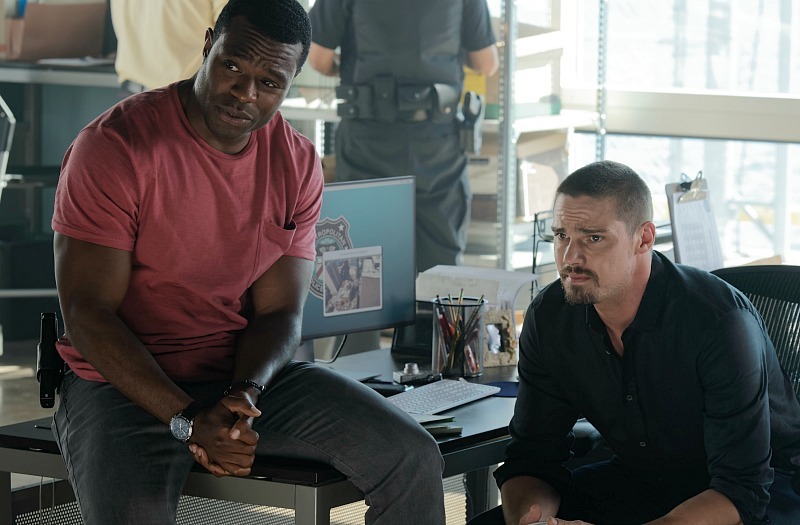 Mary Kills People is produced by eOne and Cameron Pictures Inc., in association with Corus Entertainment, and with the financial participation of the Canada Media Fund, the Ontario Film and Television Tax Credit and the Canadian Film or Video Production Tax Credit. eOne handles international distribution for the series. The series is executive produced by Tassie Cameron, Amy Cameron, Tecca Crosby and Holly Dale. Tara Armstrong is Co-Executive Producer. Tashi Bieler serves as the Executive in Charge of Production for eOne and Norman Denver is Producer.